Michael absorbed everything that had anything to do with the enjoyment of food while growing up in Montgomery County, with its farms and changing seasons and he developed an appreciation for the varied regional foods. Working in the cafeteria at Lansdale Catholic while a student, Michael’s culinary career there was short lived when those same two brothers “bowled” him down a row of tables…angering the nuns. 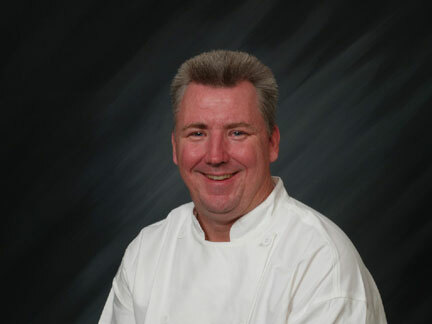 Working in restaurants and country clubs in the area, Michael decided to turn cooking into a career and was accepted into the prestigious Culinary Institute of America at Hyde Park. CIA utilizes a working kitchen as the classroom and the instructors are award-winning chefs who expect excellence at every turn. Success involves not only mastery of cooking, but also the development of thinking skills, precision, creativity, and ultimately, respect for the art and ones own abilities. Michael went on to work as a Food Stylist for Brookstone, and was a Chef at the Bostonian Hotel in Boston and honed his skills at the Famous Four Seasons in Boston. His Catering Business, Canapé Catering, has been the recipient of many awards, including “BEST IN WEDDINGS” from the KNOT. When the Buckman’s purchased the Woodside and were looking for someone to run their kitchen, Gayle remembered Matthew's words and contacted Michael. When he showed up with a steaming container of homemade Seafood Chowder and his delicious Vermont Cheddar Stuffed Potato Cakes to his interview, there was no question who’d be Executive Chef at the Woodside! Michael still caters offsite and works with clients at the Woodside to create memorable events. Have an idea or a special food in mind? That’s his specialty! A family wanting to celebrate their parents anniversary, told Michael about their love of travel. He gave them a wonderful, unique menu that incorporated foods from all of the regions they had traveled to and loved. Married and Father of two Children, Michael’s continued love of food and the challenge of creating interesting, delicious menus at reasonable prices while utilizing the areas abundance of fresh and organic foods has helped the Woodside to thrive as a new restaurant. We invite you to join us for dinner or plan your next special event with Chef Michael at Woodside Lodge! Call today 484-552-8457 to make your reservation or book your group!